R1 and R2 run HSRP on their Fa1/0 interfaces sharing the virtual IP 192.168.0.254. R1 has a higher HSRP priority (100) than R2 (90) so R1 is active and R2 is in the standby state. R1 has an OPSF metric of 101 to R3s loopback 10.0.0.3/32. The OSPF metric of 1102 divided by 100 produces the result of 11 so the track object state is up, but even so up the HSRP priority on R2 (90) is lower than that of R1 (100) so R1 is the HSRP master as long as the R1 > R3 link is up. 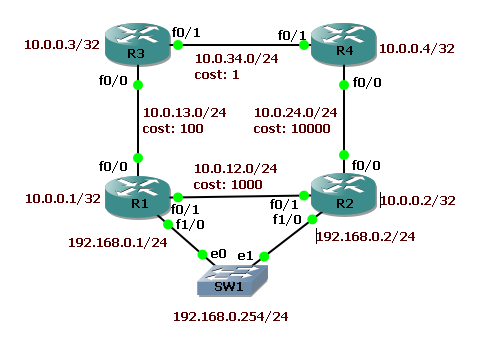 If at any point R3 should become completely isolated from the network or 10.0.0.3 is unreachable, and thus the route doesn't exist within OSPF, this will trigger the track object on R1 to change state to down. The route being unavailable has the same impact as if the threashold were exceeded.